Nestled on the edge of beautiful Dartmoor National Park with some lovely views to the front is this 5 bedroom detached house which boasts generous family accommodation in a highly sought after semi-rural located within a couple of miles of the A38, providing easy access to Exeter, Plymouth & Torbay. The property would benefit from some updating, and is being offered for sale CHAIN FREE. This property has very deceptive accommodation comprising on the ground floor a large entrance hall, sitting room opening to conservatory, family room, farmhouse style kitchen with space for a table, plus a utility room. Also on the ground floor are three double bedrooms, one of which has an specially adapted en suite wet room. In addition the second bedroom en-suite, served by a Jack & Jill bathroom, and there is a third double bedroom. To the first floor there are two further double bedrooms and a bathroom. The property has the benefit of uPVC double glazing and gas fired heating throughout. A particular feature to the property is the outside space being approximately 0.4 of an acre with added benefit of a detached garage plus ample off road parking. 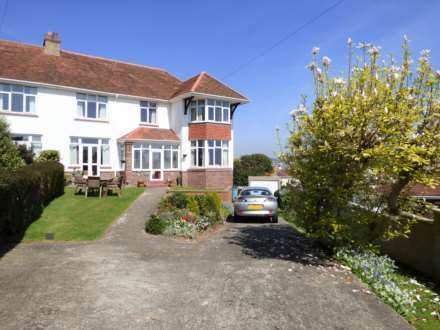 This property is located in the highly sought after area of Bovey Tracey, nestled on the edge of Dartmoor National Park. It falls within the South Dartmoor school catchment and Bovey Tracey primary school. It is only a five minutes` drive to the A38 making it ideal for a commute to cities of Exeter and Plymouth, both offering excellent retail, leisure and commercial facilities, and Exeter International Airport. Also on the doorstep are the South Devon coastal resorts of Teignmouth, Torbay and Dartmouth with their beautiful beaches and stunning marinas, making it a highly desirable base from which to enjoy the region. Cloaks cupboard housing domestic fuse board, airing cupboard with slatted shelving and access to a loft area, coving to ceiling, inset ceiling spotlights. Overlooking the side garden with wood effect flooring, with sliding double glazed door into utility area. Roll edge marble effect work surface with plumbing for automatic washing machine and space for tumble dryer under, sink unit with cupboard and drawers below, wood effect vinyl floor covering, further storage cupboards, double glazed windows and conservatory roof and two sliding double glazed doors to conservatory and rear garden. Leading off the main hallway the following rooms could be utilised in several ways, just part of a large family home or teenage area. Ideal for a dependent relative to have some of their own space, or maybe a family member requiring additional care so could provide some space for live in support. This has been especially converted to provide a wheelchair friendly environment with a modern adapted shower cubicle with grab rails, pull down seat and electric shower over. Raised WC and wash hand basin. Heated towel ladder. Down lighting. Tiled walls. Extractor fan. Obscure glazed window to the rear. Double glazed bay window to front elevation with far reaching country views, radiator, door giving access to the Jack and Jill bathroom. Double glazed Bay window to front elevation with far reaching country views. Radiator. Modern suite comprising sunken panelled bath with fitted with electric shower, vanity unit incorporating wash hand basin with storage space under, wood flooring, close coupled WC and flush, partially tiled walls with inset glass tiled border, ceiling lights, obscure window to rear, Jack and Jill door to guest bedroom and further door to hallway. Accessed via open staircase from the family room, with double glazed window to rear overlooking rear garden, gallery area with wooden ballustrade overlooking family room below, and then leading up to a further landing, door to large loft storage area. Double glazed window to front overlooking fields with some lovely distant countryside views towards Dartmoor. Radiator. Double glazed window to rear elevation overlooking rear garden, Radiator, access to loft area. A white suite with a panelled Jacuzzi bath with tiled surround, vanity unit incorporating wash hand basin with storage space under and a further wall mounted unit, inset mirror, wall lights, close coupled WC and flush. Built in shower cubicle being tiled with fitted electric shower. Obscure uPVC double glazed window to side elevation. The property is approached via a brick paver driveway with gravel parking for several vehicles. There is also a paved patio area directly in front of the property. The DOUBLE GARAGE is accessed from this area which has an electrically operated up and over door, power and light. There is also an uPVC double glazed window and door to the side. The garage currently houses the boiler room for the swimming pool (both of which require works to get back into a usable state). The gate to the side of the property leads to the side garden which is the location of the swimming pool and hot tub. The pool is surrounded by a paved patio area. Leading from the main patio area to a further patio area to the side of the property which would be ideal for alfresco eating. There is a further patio area outside the entrance to the ground floor en suite bedroom.